The Church of England Grammar School was established in Parnell, Auckland, in 1854 to provide a primary and secondary education for boys. It was the outcome of planning by the Anglican bishop of New Zealand, George Augustus Selwyn, and the stone building was designed by architect Frederick Thatcher. 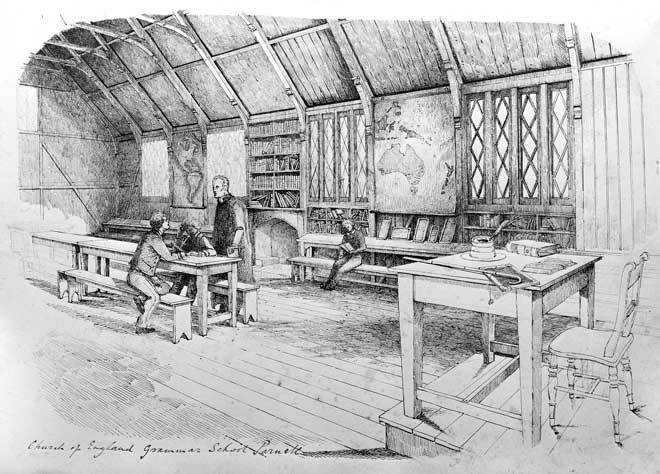 John Kinder, who sketched the interior, was the first headmaster. He took many of the classes, and his sister Fanny taught some of the younger boys. Other well-known teachers were artist J. B. C. Hoyte, who took art classes, and J. E. Gorst, who taught Greek.